According to Mensa experts, brain development in children depends on synaptic development. A synapse is a structure whose main function is to pass signals from one nerve cell to another. Since our brain conserves only 30% of energy, it will not conserve the synapse which is not used. Babies are born with more synapses than adults. In a child’s early development stages, the speed of the synapse formation is the greatest from birth until 18 months of age. From 18 months until 3 years of age during the process of cognitive development in kids, synapses continue to form and expand. The number of synapses reaches about 1,000 trillion at this age and because of that, a toddler’s brain is twice as active as an adult’s brain. This is also the reason why toddlers enjoy heavy outdoor activities such as running, jumping and climbing. From 6 to 9 years of age in kids’ development stage, the brain reduces the number of synapses which are not used and they eventually die off. It is scientifically proven that certain types of cognitive development activities influence brain development in children through the development of synapses. 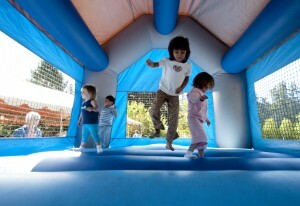 The more there are kids activities that involve physical activities and outdoor games, the greater number of synapses. These activities include bouncing on a trampoline at home or even at a theme park, playing with a ball, the hopscotch, jump the brook and many more. In order to explain how motor skills development in children can influence synaptic development, we will use a bouncing trampoline as an example. While bouncing on a trampoline, a child coordinates his/her movements and the center of gravity varies depending on his/her position. All these movements enable synaptic development in kids. We will explain some cognitive development activities for school-age children. However, you or your child can always create other games or you can let your child run and hop around as he/she wants. 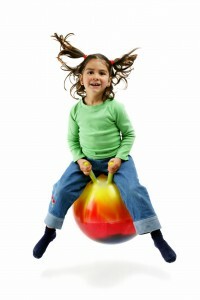 The motor skills development in children is highly important here. Here is our list of cognitive development activities for school-age children. One child gives the directions which the other child is supposed to follow. For example, one can give directions such as “run to the tree” or “run around the tree three times”. This activity is good for developing motor skills and synaptic development. Children will enjoy it because they can make up any directions they like. Draw two lines on a ground with chalk. Then, the child is supposed to jump over “the brook”. There is also a group variation of this game when two children hold the rope and the third child should jump over it. The two children throw the rope over a player and then he/she should jump when it reaches the other side. This learning activities for toddlers is suitable for toddlers and pre-schoolers. The children hold hands forming a circle. Then they sing a song “Ring-a-ring o’ roses, a pocket full of posies. A-tishoo! A-tishoo! We all fall down”. While they sing a song children are walking in a circle and “on fall down”, they sit down. One child is Mr. Fox, other children are players. The players ask “What is the time Mr. Fox?” If Mr. Fox says it is three o’clock, the players need to take three steps towards Mr. Fox. Once the players get close enough to Mr. Fox, Mr. Fox tries to catch one of them. The kids game starts with one player who tries to tag another player. The tagged player must hold still until other players touch his hand. This simple game is effective for synaptic development as it involves running around so that one does not get tagged. Activities or lack thereof is the major factor when it comes to hindrance in brain development in children. For example, sitting in front of the computer or the TV for long periods of time can hamper the development of synapses. The only movements children make are moving their fingers and hands. It is the disturbing fact that a six-year-old who sits in front of the computer or the TV from three to four hours a day has less than 40,000 movements, which is not enough for motor skills development in children and thus brain development. In addition, the accommodation, the process by which the eye tries to maintain a clear focus when the distance of the object varies, is not developed. Finally, forming of synapses takes place in the speech area of the brain as well. We all know that children do not talk much while playing games. Synaptic development is highly important for brain development in children. Some cognitive learning problems arise when your child starts school from the lack of cognitive development games for preschoolers. So, let your child run around in a park or indulge in any other outdoor activities for kids. The games and activities to do with kids for cognitive therapy that explained are maybe old-school but they are crucial for your child’s cognitive skills and brain development. Which other cognitive learning games and cognitive development activities have you tried playing with your kids? Tell us in comments!